The Gospel of Our Mother God is a kind of handbook for those who follow the Mother Faith. 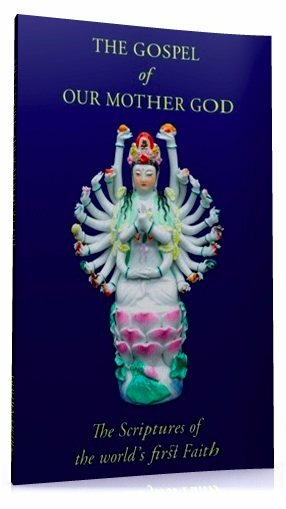 While we do not have a tradition of direct divinely-inspired Scripture, this book attempts to convey the fundamental message of the world's spiritual traditions in a feminine form. It is a book for the growing number of souls who are attracted to traditional, devout religion; who wish to practice devotion and pure worship, but who are alienated by the male-centered patriarchal religions of the modern world. It is unlike any other book available today. It is not a "Goddess book" in any current sense of the term. It is not influenced by Wicca, neo-paganism or New Age ideas. It is not a "feminist spirituality" text. This is a collection of including extracts from Vedic scripture as well as more recent sutras inspired by the tradition of the Divine Feminine as the sole, supreme Deity, the Creatrix of the universe, the First Cause of all being and the loving Mother and Savior of all life. The myths and sutras in The Gospel of Our Mother God are purely feminine. No male figures appear at any point. This is not a compilation of current thought with a "spiritual" tinge, it attempts to reflect pure and very traditional religion in its feminine form – the form in which religion first appeared on this earth. For those who do not need this book, it may have no value at all beyond a passing interest – but for those who have been searching for true feminine religion it is an oasis in the desert of traditional patriarchy on the one hand and non-traditional "feminist spirituality" on the other. Before and beyond all things is the Mistress of All Things; and when nothing was, She was. 4. It is Love that holds the drop of dew pendent upon a blade of grass, neither flowing forth in watery profusion, but swelling within the unseen urn of its brief harmony. 5. It is Love that holds the stars within their courses, and all the worlds of the immeasurable cosmos within the harmony of the celestial music. 6. Truly, all the cycles of the times and the seasons; all the rhythms of the soul and of the mind and of the flesh: truly all these flow from the love of Our Lady, the Maid, that creation may not decompose, each several member flying away into black eternal chaos. Unless your souls be simple as the running deer, My children, and your hearts as little children filled with wonder, how shall you attain liberation? 2. Let your ways be gentle as the milk-white dove, and graceful as the gliding of the swallow. 3. For there are ways and rhythms in the course of life, of day and night, of seasons and the moon, by which all life, all thought, all work are governed. 4. And these movements are the breath of the Divine, reflected in the highest spheres and every living thing. 12. But the Maid replied, saying: That which is right in the deepest heart of things, and in the centre of all being, that is right and none other; and the Truth alone is true. 13. Nor shall all the powers of the earth count against it, neither all the powers of the seas and the skies move it by the smallest fraction in all its vastness. 14. I shall obey none but My Mother, though all your power be turned in fury upon Me. 15. And the demons cried: Not our power, but the power of one far greater from whom our power derives. 16. And the Maid said: Thus may it be. 17. And the demons questioned Her, saying: Think You that Your Mother will save You? 18. And the Maid answered: She will do what She will do, and blessed is Her Name. 19. And the demons laughed, saying: Then are You abandoned to the uttermost darkness. 20. And the heart of the Maid fainted within Her. 21. And She said: Thus may it be. 27. None shall call upon Me and be lost. Every cry of the world shall I heed; and when the whole of a heart cries upon Me, that soul shall I take beneath My mantle. 28. Cry and thou shalt have answer; love and thou art beloved, hope and thy hope shall be fulfilled, in this world and in all the worlds to come. 29. Hold thou fast to the Truth, for the Truth is a pillar; a steadifast pillar that all the world cannot shake. 30. Not by the breadth of an hair has it moved since time’s dawning, neither yet by the breadth of an hair until time have its end. 31. From the uttermost height of the Heaven descendeth the pillar; descendeth it down as a glorious pillar of Light. To the nethermost depths of the hells it descendeth; nor the might of the demons can move it the breadth of an hair. 9. And the children of earth rejoiced, saying: It is the Mistress of All Things, come to seek Her Daughter. And the Dark Queen ordered the gates of Hell to be shut and barred against Her. 10. And the gatekeeper stood within the gate, and cried: Who is it that comes upon the realm of the Dark Queen? 11. And She answered, saying: I am the Mistress of all that is, and the Mother of My Daughter. 12. Give Me entrance, for if you give Me not entrance, I will smash the bolt and shatter the gatepost. I will raise up the great gate of Hell and break it asunder. 2. For She that created you also loves you, even to the end of the age. 3. Take heart, though you have turned from Her. 4. For She has not forsaken you, neither are Her eyes filled with anger. 5. And Her hands that have shattered the gates of Hell shall not harm you; that have broken Hell’s foundation shall be lain on you in gentleness. 6. Therefore hide yourself not from Her, and put aside the tangled weeds of thought that strive each with the other. 7. For of all things, love is the simplest. The Gospel of Our Mother God is available at $14.99 including postage to any part of the United States. If you are seriously seeking real feminine devotion, this could be the most important purchase of your life.